It’s been a summer full of work, fun, food, and friendship. Many ping pong battles have been fought, cries of agony and celebration over code, and slow enjoyable summer nights hanging out after work. It hasn’t just been a summer job, but an experience that all eight of us have shared together. Some days this was discussing outdated technology in book club, and other days it was laying on the floor trying to understand the best way to move forward in the project. Now as the summer comes to an end, so does our internship. We may be leaving Rustici, but we take our memories, new friendships, and work experience that we can carry with us into the next part of our lives. We came to know one another over sushi, playing ping pong, and being a part of the Intern Alley. We were all different, coming from different backgrounds, but we came together to form a team of interns under Brian. When things went wrong, there was a problem we couldn’t figure out, or needed a partner for ping pong, Brian was there to help. Thanks for putting up with our craziness, our frustrating days, our happy days, and days where we thought we got a lot done but we probably actually hadn’t. You pushed us in the right direction, allowing us to learn a great deal, but also helped us when we needed it. Thanks for being our leader this summer. The experience provided by Rustici Software was a unique and beneficial experience. We had full days learning from people and working on the intern project. We learned about things like marketing tools such as Marketo from Jeff and Lizelle, how to run a company from Mike and Tim, and what not to do in an interview from Jena and Laura. The work wasn’t always easy when we had to redo code that accidentally got deleted, redraw wrench after wrench for the logo, or when there were large pull requests that created new conflicts and needed rebasing. But we pushed through the hard days, and we can now leave with our heads held high, knowing we worked hard over the summer and we learned a great deal that has made us better students and better people. 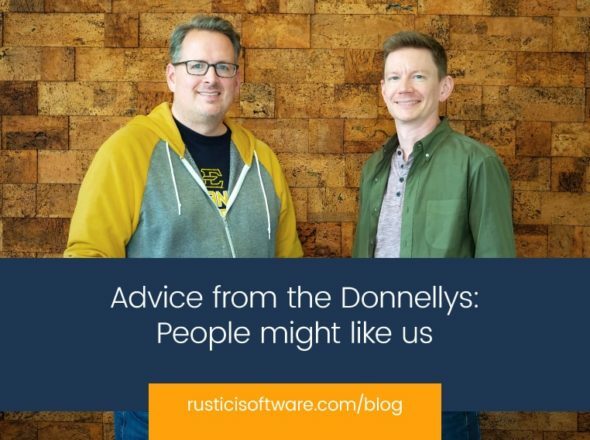 So thank you Rustici Software, for giving us a unique summer experience that not only gave us a job for 14 weeks, but gave us more knowledge and a community.